Some moderate air pollution will hit Shanghai under the influence of cold weather front today. Met office urged caution in heavy fog forecast for the morning. Shanghai’s air quality index (AQI) is forecast between 135 and 175, or moderately polluted, today, with tiny particle PM2.5 the major pollutant. Shanghai activated 2018’s first blue air pollution alarm at 8pm yesterday after the air quality index (AQI) reached 202, or heavily polluted. The blue air pollution alarm means ordering construction sites to suspend open-air operations and heavy industry factories, especially those discharging large amounts of volatile organic compounds, to reduce waste discharge. The blue alarm, lowest in the four-tier system, is activated when there is moderate pollution (AQI between 151 and 200) and short-time heavy pollution (over 200) predicted in the next 24 hours. Citizens, especially those with heart and lung diseases, are reminded to avoid outdoor activities. This round of air pollution was brought in by cold front. Also, fog is expected this morning again after Shanghai triggered a second-highest level fog alert yesterday, said the meteorological bureau. The city’s poor diffusion caused by humidity and lack of wind, as well as pollutants carried into the city by cold front from the north, are the major causes of this round of pollution, according to the Shanghai Environmental Monitoring Center. The city’s AQI will fall slightly this evening to between 120 and 140, or slightly polluted. The situation will further improve tomorrow with the index forecast to be between 105 and 125 – still slightly polluted. By Friday, Shanghai’s air quality will be back to good with AQI falling to below 80, according to the center. The cold front will lower the temperatures in the city starting from tomorrow. According to Shanghai Meteorological Bureau, today will be cloudy with temperatures ranging between 14 degrees Celsius and 8. Thursday will see 12 and 6 degrees. Drizzling rain is forecast for late Friday with temperatures dropping between 11 and 7 degrees. High level of humidity and lack of wind, as well as low clouds led to dense fog yesterday morning, covering Songjiang, Minhang, Jinshang, Fengxian, Chongming and Pudong districts where visibility dropped to less than 200 meters. The meteorological authority triggered an orange color fog alert, the second-highest of the three-tier system, at 5:46am. Safety measures had been implemented around the city to ensure public safety in the thick fog. Speed limits were imposed on expressways. The police force has been nearly doubled to help manage the traffic under heavy fog. An emergency lane was opened on Xupu Bridge for moped and bike riders to cross the Huangpu River. All ferry services across the River were shut down yesterday morning. The fog started to disperse from noon. No serious road accidents had been reported in Shanghai, said traffic police. About 50 flights were canceled and nearly 100 were delayed at Shanghai’s Pudong and Hongqiao airports early morning. Another 50 flights at both airports were diverted to other destinations yesterday. According to Shanghai Meteorological Bureau, fog may affect some areas of the city this morning again although it is not expected to be so thick as yesterday. 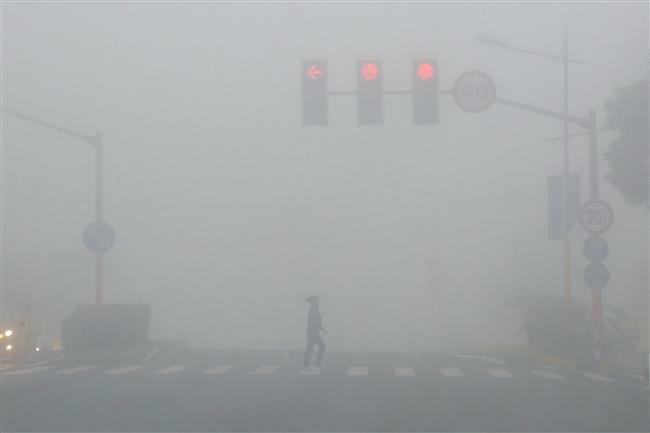 “Dense fog like this is not rare for Shanghai in winter, although it took much longer time than usual for it to disperse,” said Zhu Jiehua, chief service official of Shanghai Meteorological Bureau. According to Zhu, the fog was caused by the arrival of some warm and wet air mass from the sea. When the air mass encounters the low temperature on the land, fog will be formed in cooling vapors. “The meteorological condition this morning will be similar to yesterday, which can easily lead to fog,” warned Zhu.